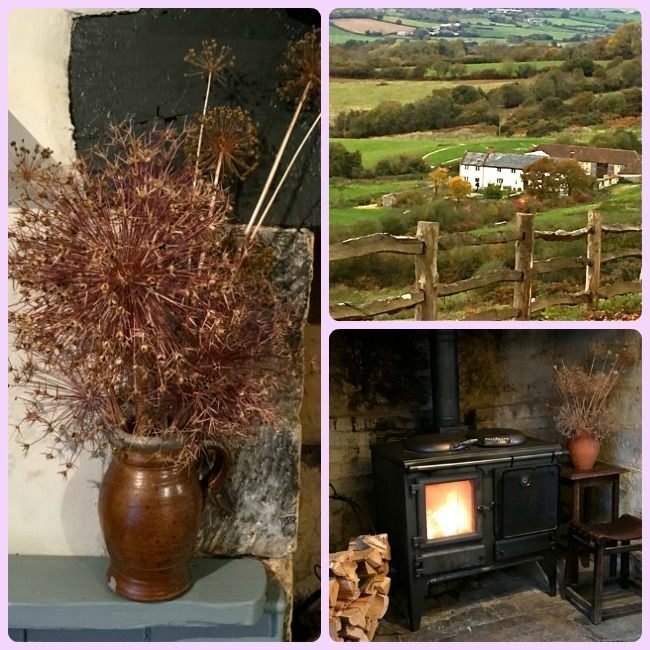 River Cottage, near Axminster in Devon is a fabulous place and the food is truly wonderful. That has certainly been my experience so far. On Tuesday I was lucky enough to visit for a third time at the invitation of Foodies100. It was a River Cottage Christmas special for food bloggers. It was touch and go as to whether I’d make it or not. I was planning on driving there and back on the day, but car problems arose and if it hadn’t been for Hayleigh at Budget Food Mummy coming to my rescue, I would have missed out on a scrumptious event. As it happened our intrepid Cornish contingent arrived early. This gave Hayleigh and I a chance to wander around the gardens and admire the profusion of kale varieties growing there and the many flowers that were still going strong so late in the year. One of the many things I like at River Cottage is the exuberance of floral displays they have in every room. In the dining area, they had vases of flowers as well as vegetables decorating the room. There were also various flowers hanging up to dry, which gave a festive air. This was the first time I’d been to River Cottage during the cold season and I wasn’t quite sure what to expect. I first visited in July 2014 for a fabulous preserving course with Pam the Jam. Last year we spent the day at River Cottage in the warm September sunshine courtesy of Foodies100. Not only did we turn up in the middle of a cold snap this time, but it was a dark and rainy evening too. Warm clothes were definitely needed, but the cottage was cosy with a roaring log fire and the yurt also had a large welcoming fire at its centre. It was good to have time to look around, catch up with friends and meet new bloggers, but we really couldn’t wait for the main event – the River Cottage Christmas dinner. It was a meal worth waiting for with the usual gastronomic art of layered tastes and textures that I’ve come to expect from River Cottage. Each mouthful is an exquisite adventure. Although meat is a focus at River Cottage, we vegetarians were very well catered for. The chefs decide the menus on the day according to what’s available in the garden, farm and larder and it’s all organic of course. Kingston Black Apple brandy aperitif – delicious apple brandy which despite being 18% proof, was smooth and very quaffable. carrot hummus on rye bread. whipped goat’s cheese and beetroot marinaded in cider vinegar. leek, mushroom and blue cheese croquettes with green tomato chutney. roasted romanesco with romanesco puree. Starter: celeriac ravioli with wild mushrooms, sage and salad leaves. Main: parsnip and potato rosti with poached egg, carrot puree and cabbage fried in butter and garlic. Served with haricot beans cooked with tomatoes, fennel and onions. Dessert: honeycomb crème brûlée with apple purée, apple crisps and apple rye & treacle crumble. Coffee with orange truffles to finish. As well as the venue for the well known television series with Hugh Fearnley-Whittingstall, River Cottage has a well established cookery school. Courses run from one to four days and range from foraging to baking to Christmas. Dining evenings such as this one are a regular feature and private events, including weddings are also catered for. Many thanks to Foodies100 for arranging River Cottage Christmas and to River Cottage HQ for being so hospitable and welcoming. I was not required to write a positive review and as always, all opinions are my own. The food sounds gorgeous and I’m sure you had a fantastic day! I’m rather envious as I’d love to go there one day! Great review of a truly wonderful evening. I wish I could have sampled the vegetarian menu. Greedy but true! It’s quite a special place Corina and I’ve been very luck to go there. Not only is the food phenomenal, but the place has a lovely feel and the staff are all very friendly. wow lucky you and the food looks truly beautiful and tempting! Yes, very lucky me indeed. It was a fabulous experience on many counts. Thanks Chris. It was good to see you again too. Cold and roaring fires was a bit different to the last time we were there – fun to experience the different seasons. River Cottage is a fabulous place and the food is wonderful. Plus it’s always good to meet-up with other bloggers. Oh it sounds like it was so lovely, I was really gutted that I couldn’t go. That romanesco looks delicious! It was a shame you couldn’t come Rebecca, we missed you. I roasted up some romanesco on the strength of that dish last night – delicious! It really was lovely. The vegetarian food looks delicious, I kind of wish I had it now! Thank you for being supportive on the drive home, I think I would still be trying to find my way out of Devon!! The food was just gorgeous. As for the drive home, it was certainly an adventure. Thank you so much for the lift. Thanks Kath. The problem with the car is that it’s getting rather long in the tooth – or did I mean wheel? Another trip to River Cottage. Fabulous. Liked your photo tips on your last trip. What a fantastic get-together! I’ve heard so many good things about the River Cottage retreat. I’d love to go one day! I think you’d like it Elizabeth. Crossing fingers you will indeed make it one day. Sounds a fantastic trip, it’s a place I would love to go. Hoping I can go next year. It’s definitely worth going if you can make it Sarah and it would be good to finally meet you too. Ha, co-incidence. Would have loved to see you there too Dom. it’s a lovely place Kate, rustic with fantastic food and a relaxed atmosphere. What a treat Choclette, that veggie Christmas menu sounds incredible, gorgeous flavours and some fantastic ideas. If only more restaurants would be this inventive with their veggie Christmas fayre! Must try to make it to one of the River Cottage events one day, they sounds fabulous. Oh yes do Kate. They are definitely worth going to. I’ve not been disappointed with the food yet. It does look like a fabulous event. I’d love to visit River Cottage one day – this time the dates really didn’t work for me. I really like it Fiona, it’s a very informal affair and the food is fabulous. It sounds like a great experience, maybe one day I’ll make it to River Cottage! Yes, we were very lucky to get invited to such a fabulous venue Rebecca. I’ve seen quite a few images on social media of the Christmas at River Cottage over the past few days, it certainly sounds like you had an great time, and the vegetarian menu sounds absolutely scrummy. Oh it was indeed absolutely scrummy and so nice to be able to meet up with other bloggers too. The food sounds lovely and you cannot beat the countryside around River cottage. The canteen is in Axminster also which does great food. We at Spillers of Chard are not to far away either just down the road we have a 12,000 sqft showroom with Aga cookers, built in appliances and beautiful kitchens to browse. It was such a lovely event and it was great to meet up with you too. It was good to see you again too Nayna. You can rely on River Cottage to come up with some wonderful and interesting veggie food.